We had this for dinner last night and my family loved it!It wasn’t hard to make at all and it was a great blend of flavors! Add penne pasta and cook until done (about 12 minutes) then drain. In a large skillit, brown diced onion, 3 cloves of minced garlic and ground beef over MEDIUM heat. Add spaghetti sauce and warm through. Preheat oven to 350 F. Lightly oil or spray a 9×13 baking dish. Layer as follows; 1/2 pasta, 16 oz sour cream, 6 slices of provolone cheese, 1/2 sauce mixture, remaining pasta, remaining sauce mixture, 6 oz shredded mozzarella cheese. Just found this sight today. Was trying to decide what to make for dinner tonight, so I chose your baked penne pasta. I actually doubled the recipe, because it takes that much to feed my family at times. Have to say it was very delicious, my family loved it, with a side of garlic bread. 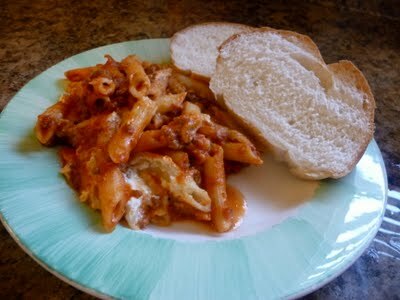 Will definitely make this again, it's like a combination of baked mostacciolli and lasagna. Look forward to trying some of your other recipes. hi, do you drain the grease from the meat before adding the spaghetti sauce? Another fantastic recipe! I loved the taste of the dish, and there was definitely enough for leftovers! I'm journaling my journey in cooking over at my personal blog, so I've added the recipe there, but linked it back to this one! Thanks for the deliciousness! This recipe was so delicious! I love this site! Did you season the sauce or meat? Seems like it could be bland. Hoping to make this in a few days for some guests. I have made several other recipes of yours and love them all, but wanted to check. Also, it looks like it's been several years since this was posted so maybe there are updates to the recipe.